History was made in Spring 2014 when a restored classic 1940s Southern Railway passenger carriage ran to Corfe Castle for the first time since the summer of 1966 - when England won the World Cup at Wembley. Several hundred of the distinctive “Bulleid” carriages were built by the Southern Railway at Eastleigh, Hampshire between 1945 and 1948 but only 7 Southern built examples survive in preservation - four on the Swanage Railway, two already restored and two awaiting restoration. The first run of the recently restored wooden framed carriage from Swanage to Corfe Castle and Norden Park & Ride took place on Saturday, 15 March, 2014. 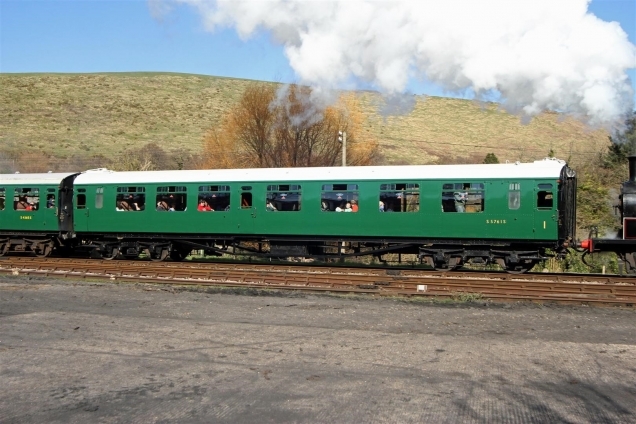 A team of 18 dedicated Swanage Railway volunteers took more than three years and 10,000 hours of work to restore the carriage, the 1947 built 48-seat first and third class compartment coach No. 5761, to its former 1940s glory - at a total cost of many thousands of pounds. Withdrawn in 1968 and sold privately, No. 5761 had the distinction of being one of the last Bulleid coaches to be in traffic with British Rail. Swanage Railway Trust Chairman Gavin Johns said: "The return of No. 5761 to traffic is the culmination of more than three years and 10,000 hours of hard work by a small team of volunteers. They are to be congratulated for their determination, professionalism and attention to detail - a marvellous job. "The Swanage Railway now has two well restored 1940s Bulleid carriages which are reminiscent of exciting holidays to the seaside as well as more mundane journeys to school and work over nearly 20 years. These two carriages are an important part of our railway heritage," he added. Designed by Oliver Bulleid of the Southern Railway, the distinctive coaches were used on express trains from London to Southampton, Bournemouth, Weymouth and the West Country from the 1940s until the end of steam in 1967. With their comfortable moquette seating, chrome luggage racks, wooden panelling and framed wall prints of local tourist spots, the coaches were also used on branch trains between Wareham and Swanage from 1964 to 1966. The carriage was originally put together with thousands of chrome brass raised head screws and to ensure authenticity, great care was taken to use these to secure all the visible panelling, mouldings and chrome plated fittings. Although original screws were used where possible, many replacements were needed and Andy at Screwsline was extremely helpful in advising us and supplying all the high quality screws we needed. The Swanage Railway has a further two Bulleid coaches awaiting restoration and donations for this work are welcome. Visit the Swanage Railway Trust website at www.swanagerailwaytrust.org.uk or send a cheque to Swanage Railway Trust Heritage Coach Fund, Station House, Swanage, Dorset BH19 1HB.